Sailors in a motor launch rescue a survivor from the water alongside the sunken USS West Virginia (BB-48) during or shortly after the Japanese air raid on Pearl Harbor. USS Tennessee (BB-43) is inboard of the sunken battleship. Note extensive distortion of West Virginia's lower midships superstructure, caused by torpedoes that exploded below that location. Also note 5"/25 gun, still partially covered with canvas, boat crane swung outboard and empty boat cradles near the smokestacks, and base of radar antenna atop West Virginia's foremast. 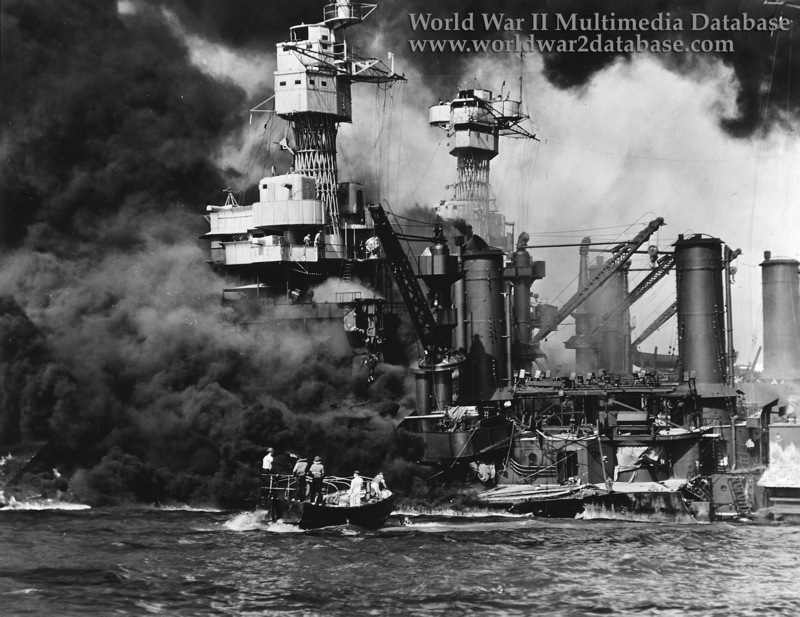 106 sailors from USS West Virginia died in the attack. Later examination revealed that West Virginia had taken not five, but six, torpedo hits. With a patch over the damaged area of her hull, the battleship was pumped out and ultimately refloated on May 17, 1942. Docked in Drydock Number One on 9 June, West Virginia again came under scrutiny, and it was discovered that there had been not six, but seven torpedo hits. During the ensuing repairs, workers located 70 bodies of West Virginia sailors who had been trapped below when the ship sank. In one compartment, a calendar was found, the last scratch-off date being December 23. The task confronting the nucleus crew and shipyard workers was a monumental one, so great was the damage on the battleship's port side. Ultimately, however, West Virginia departed Pearl Harbor for the west coast and a complete rebuilding at the Puget Sound Navy Yard at Bremerton, Wash.